I loved this story so much, for so many different reasons. First of all was the way I could relate to Annie. I hate running, too! So the idea that she couldn't even do two laps around her school track at the beginning of the book, yet she is training to run a marathon was fascinating to me. As I was reading, I found myself thinking that her program with Matt sounded really cool. If I could find a Matt, I might consider doing it. Might. But on the flip side, I loved this story because I couldn't relate to it. Annie grew up without a lot of money, but this is not the focus of the story -- and I love that. Because she never sees herself as a victim. It's just a fact of life that she lives in a trailer and her mother never graduated high school because she got pregnant. But Annie is working hard for her dream of going to college. And while she is madly in love with Kyle, when he proposes and asks her to give that all up, so does not. I really admire that. Another reason I loved the story was because I grew up in Tennessee. Not a town like the one Annie is in, but close enough where the scenery she describes reminds me of home. And I had friends that went to MTSU, so it was really cool to read about that. I loved Annie's personality -- Miranda Kenneally wrote this story to where Annie's voice is so distinctive -- you feel like you're just sitting down with her over a beer and she is telling you this story. She has a sense of humor and I really enjoyed her thoughts and interactions with the other characters. I loved that this is kind of the fifth book in a series, but is also a stand alone. I haven't read any of Miranda's other books, but I did not feel like I was coming into the middle of the story or that I was lost about what was going on in any way at any time. In case you missed it, I loved this story. There are a few components, though, that I didn't necessarily love. First of all, Annie deals with a sense of guilt throughout the book -- she feels like it it her fault that Kyle died. I can certainly understand why she feels like that, but that is never really resolved -- for lack of a better word. I don't think she tells anyone that she thinks Kyle's death is her fault, so no other character can offer her absolution. And she does not ever give it to herself. Similarly, I don't know how I feel that Jere has Annie go ziplining and then she's like, "Okay, I understand why you're an adrenaline junkie." And she starts to equate Jere being an adrenaline junkie to how she should take risks in her life and such. It's almost like she now thinks it's okay...and I don't know if I do. I know it would be unrealistic for Jere to end the book with agreeing to never take any risks again, but maybe a middle ground between the extremes of Annie condoning versus Jere never doing anything risky again. Finally, there is something that happens to Annie and Jere near the beginning of the book that I don't think needs to be part of their story at that point in order for their story to be what it was. 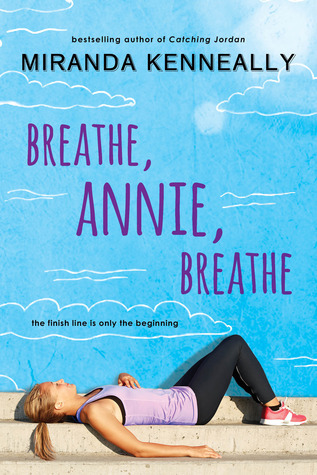 I loved the multiple meanings of the title: Breathe, Annie, Breathe. What an amazing title! Because on one level it is referring to her remembering to breathe while she runs. On another level, it's about her needing to remember do things to move her forward in life and out of being stuck in grief. It can also refer to her having to remember not to snap at her Mom every time she mentions Kyle, to slow down her heart rate when physical contact with Jere speeds it up, to make it gracefully through an awkward situation like with her friends or Kyle's family or at the Roadhouse. Basically, it's like a call of, "You can do this!" Which brings us back to why I love this book. 5 of out 5 stars!